Add another dimension of stretching to your repertoire. 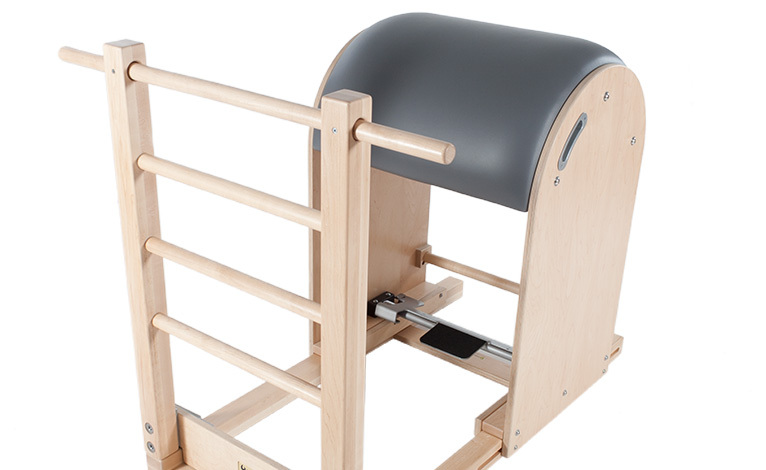 Complete your studio with a Balanced Body® Pilates Ladder Barrel for core strength and flexibility exercises. 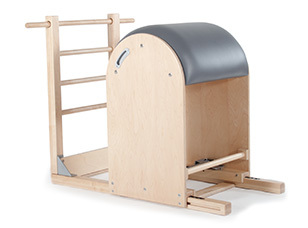 It combines ladder rungs with a barrel surface for stretching, strengthening and flexibility exercises. The barrel connects to the ladder by a sliding base that adjusts to accommodate different torso sizes and leg lengths. You will love our system for adjusting distance between ladder rungs and barrel – one fast and easy movement while standing. Just press the foot pedal, slide to desired position, and release the pedal to lock it securely in place. And we still provide double foam padding for extra comfort doing prone exercises like Swan, or sidelying exercises like Side Sit Up or Mermaid. You will love the difference it makes. Ten preset locations on the sliding base provide settings you can repeat precisely. Engraved indicators make it easy to see the setting you have selected. Up to 10” (25cm) of adjustability to accommodate different torso sizes and leg length. Helpful, easy-grip handles on the barrel. “Comfort zone” padding offers double-layer comfort, stability and support, especially for prone and sidelying exercises. Grab bar beneath the barrel for enhancing flexibility. Secure fitting provided by bottom foot brace. Durable, beautiful reinforced frame of Rock Maple and Maple laminate. Stock product sold online comes with Black upholstery. Or choose from 26 custom colors.